Anderson is home to 192,810 residents and covers Anderson city – its county seat – Belton, Pelzer, Piedmont, Williamston, and Pendleton. Anderson’s history is much like that of Pickens county, having been conjoined with other parts of the state, then separated, then brought together again, and then finally allowed to be a county of its own. Anderson’s nickname is the “Electric City” for the fact that it was one of the first cities in the southeast to have electricity. 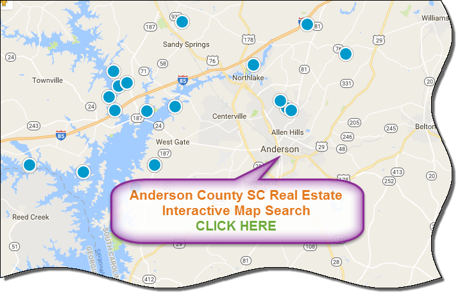 There are plenty of Anderson county SC homes for sale for those who are willing to experience what they county has grown into since its inception. Today, Anderson still boasts its history through museums, historic houses, and mills. Residents can explore the county’s history, or enjoy the way the county has grown over the years by enjoying parks, nature trails, lakes, the theater, and so much more. Anderson county is home to 5 different school districts (districts 1-5), all of which are highly ranked against other districts in the state. Some of the categories the districts are ranked in are best academics, best administration, best food, and best sports. Anderson has grown and expanded since its inception, and continues to invite residents and visitors from all over with its passionate history and continued expansion. There are plenty homes for sale Anderson county SC for every family.